After my last post, I received a number of requests for more Navy stories (and pictures). So, instead of sticking to the usual “book writing” related posts, I thought I’d break things up a bit with swashbuckling tales from the high seas, or high explosive stories from on observation post (I spent four of my eight active duty years serving alongside the U.S. Marine Corps). A good friend and old shipmate gave me the idea for this first post…funny he would remember this picture over everything else. Then again, the photo was snapped on board our ship, and not out on liberty. I still come across photos from various liberty ports, and I can’t remember the circumstances of the picture’s origin. I’m told that the high formaldehyde content in the beer out there is to blame for this. I think several beers, regardless of the formaldehyde…followed by an unknown number of tequila shots was the real culprit. I’ll save some of those stories for later posts. So here we start, with a little taste of Ensign Steve Konkoly’s days as a division officer, aboard one of the finest warships in the Pacific fleet, the Oliver Hazard Perry class frigate, USS THACH (FFG43). It really was a good ship, but at times I felt like she was probably better suited for combat on the waters that made Oliver Perry famous, Lake Erie. Here I am, hard at work in my stateroom, wearing my favorite hat…which I could only wear in my stateroom, and had to remove quickly if I heard the Captain or Executive Officer nearby. 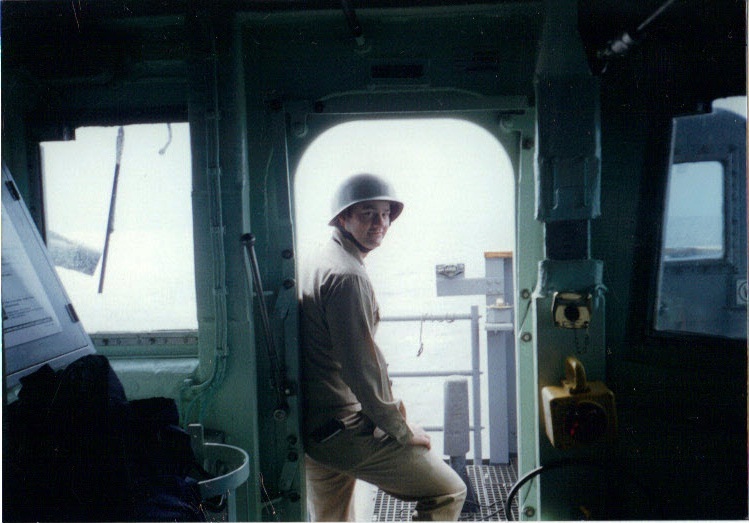 The picture may be a little fuzzy, but this was me about 15 years ago, and the hat is not official Navy issue. A little masking tape, a red marker and a “confiscated” red hat that someone had left lying around. 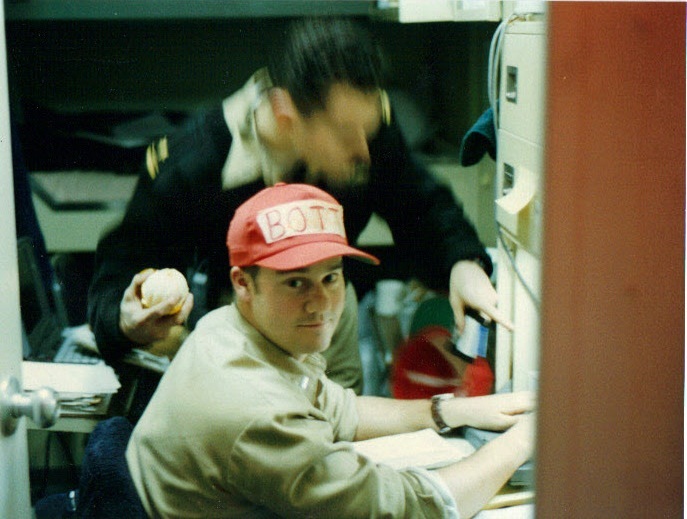 It reads BOTT, and if you can figure out what it means right now, you’re way ahead of me on this post…and you too may have been scarred deeply by the Navy. One of the key principles to the entire system was The Training Team…many of them actually. 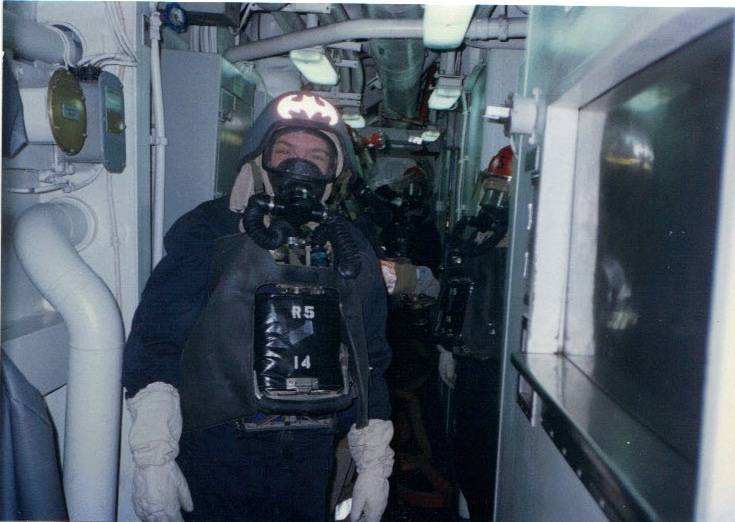 You see, not only was the ship graded by the crew’s ability to handle prescribed emergency situations (missile attack, loss of ship’s power, fire in the engine room, flooding, chemical attack, etc. 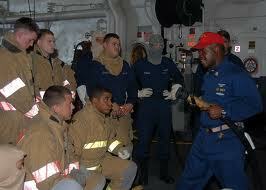 ), but the ship must have a qualified training team, capable of continuing this training throughout the year. The training team taught and evaluated the crew, and in turn was evaluated and trained by our ship’s superior command, The Destroyer Squadron in Japan. It actually made sense. 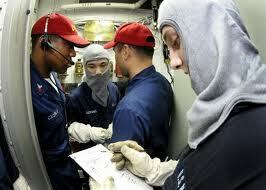 When we were 30 days out to sea, we constantly trained, and we needed competent teams to evaluate our performance. On a ship of approximately 200 sailors, this presented an interesting dilemma, which led me to create my special hat. We had a lot of training teams, and these were coveted positions. Let me list the teams: Combat Systems Training Team (CSTT), Shipboard Training Team (STT), Damage Control Training Team (DCCT), Engineering Control Training Team (ECCT)…and there must have been more. I can’t remember them all, because they ran out of colors of the rainbow for their distinctive hats (like the one I created…actually, red was for the DCCT). With ten or more members on each team, a comprehensive shipboard drill could involve 50-60 personnel roaming the ship, evaluating different aspects of the crew’s performance. These pictures are not from my ship, but it gives you an idea. Notice in one picture, there are two trainers in the same spot! So what? Well, first of all, this didn’t leave a lot of crew to man the ship, and it caused a lot of turmoil. Finally, and most importantly since this is my blog…I wasn’t on a formal training team. As a “seasoned” junior officer, and one of few qualified to stand Deck Watch on the bridge, I spent most of my time in the open air staring out at the ocean, making sure the ship stayed on a safe course and out of harm’s way. 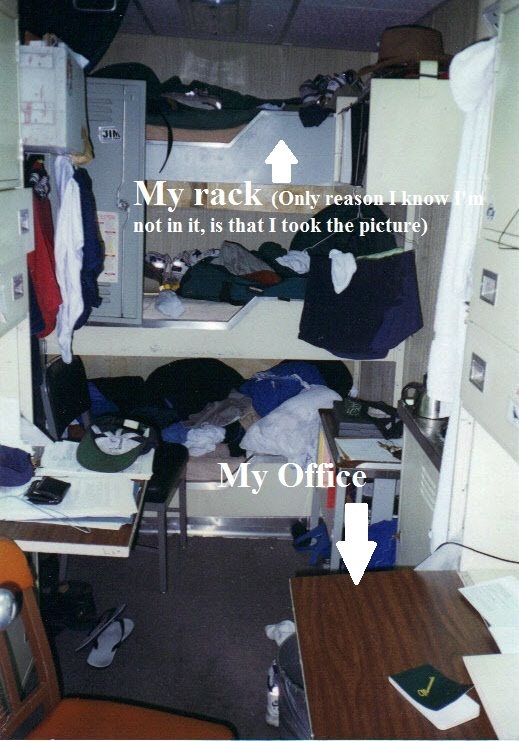 I probably wasn’t the best Officer Of the Deck (OOD) in the Navy, but I held my own on USS THACH, and this station eventually became my General Quarters post. If the General Quarters alarm sounded, I reported to the bridge to take command of the deck. I performed well under stress on the bridge, and I loved the responsibility. Until I realized this would keep me from serving on one of the Training Teams, and would land me in a bizarre seagoing purgatory. Over the course of several stints at sea, I grew tired of the bridge. I already rotated through the regular “at sea” OOD position with two other junior officers, so every 8 hours, I reported to the bridge to stand watch for 4 hours. Then, I would finally be relieved, and guess what? We had an emergency fire fighting drill in one hour, so guess what? I got to visit the head, drink a glass of “bug juice” (Navy term for Koolaid…but way worse) in the wardroom, and head back up to the bridge, because the officer that just took over the watch was on one of the training teams (he had to meet with the training team 30 minutes before the drill). I’d be up there another hour or two, until the fire drill concluded, and the “training team” had debriefed, with coffee I’m sure. 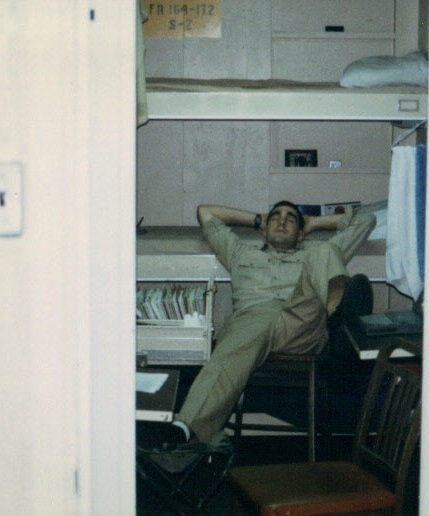 Even better, I’d finally be off duty for a half hour, then I’d see my roommate (stateroom is the official Navy term) put on one of his multi-colored hats, and start to leave. Full of dread, I’d ask him where he was headed, and he’d whisper that the ship would experience an unannounced flooding drill in thirty minutes. Son of a mother $%! @$&, I’d be back up on the bridge against my will again! That’s pretty much how I felt every time I climbed the ladder leading to the bridge. I think I was the only one on board with an actual hat, but I wasn’t the only one on the team. Anyone not assigned to one of the Training Teams was automatically enrolled. We had a lot of members, and I guess I was their de facto leader. A fact I would become extremely proud of as the days at sea rolled into weeks. That’s me standing on the bridge, with the old fashioned WWII helmet that we were required to wear, in case a paperback book fell on our heads. Wouldn’t do much to stop a fragment…I think I cracked one putting it one the navigation table while taking a break from the heat. Still, it’s a timeless picture that could have been taken before one of the great battles of the Pacific during WWII (I’m pretty sure the helmet was a relic of that time). I guess life could have been worse for me. I could have been dressed up like Batman in firefighting gear for hours on end, in 100 degree heat. Some officers found a blissful peace during these drills, which came in the form of a precariously balanced nap in their stateroom. Sorry, Chip, this isn’t the best representation of your work product, but it was the only picture of an officer napping that I could find. I couldn’t take a picture of myself, and frankly, who could have seen my sleeping in this mess. I hope you enjoyed this little glimpse into life at sea. Fun read, Steve. Thanks for serving. Not sure how I got into this page while net surfing but great description of the life on the Thach. Great seeing you on the net. My pleasure, John. For serving and writing. for the record, i’m not sleeping. while steve and the rest of the ship were playing their fireman games, i was selflessly balancing my chair to maintain the ship’s center of gravity (crucial for fire fighting.) my eyes are closed to help concentration. I knew there was something special going on…that’s why I took the photo. If the ship ever really caught fire, someone would have to balance themselves in the same position. We should have put tape on the floor under the legs of your chair. This must have been something you learned at SWOS, before they watered the course down. Don, I was planning name the post, “Last of the Bohicans,” which could have been the title of any movie filmed about my first (and last). Write another book. Jakarta Pandemic was great!! Looking for another book from you soon. Please. I’m hard at work on a second book. You can find a sample here, and I plan to post another shortly. By my calculations, I should finish this next book by the end of September. Glad you liked The Jakarta Pandemic. If you get a chance, shoot me your email, and I’ll add you to my relatively non-intrusive email list. Thanks!